All awards are for a period of residence to use the AAS library's resources for research and writing. The following long-term awards are intended for scholars beyond the doctorate. Hench Post-Dissertation Fellowship: The purpose of the fellowship is to provide the recipient with time and resources to extend research and/or to revise the dissertation for publication. 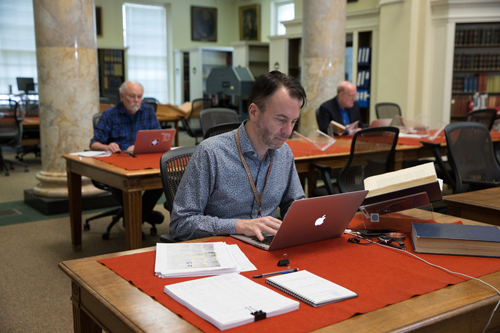 Established as the Mellon Post-Dissertation Fellowship in 1998, the fellowship has been renamed in honor of John B. Hench, who retireed as vice president for collections and programs after thirty-three years on the staff of the American Antiquarian Society. The Society welcomes applications from those who have advance book contracts, as well as those who have not yet made contact with a publisher. The twelve-month stipend for this fellowship is $35,000. AAS-National Endowment for the Humanities Long-Term Fellowships: At least three fellowships will be awarded for periods extending from four to twelve months. Funds come from the National Endowment for the Humanities. ACLS Frederick Burkhardt Fellowships: The American Council of Learned Societies will award these one-year residential fellowships for which recently tenured humanists may apply. The American Antiquarian Society is one of thirteen major research libraries and interdisciplinary centers participating in this program.